To learn more about the Common Read program and for access to the discussion guide click here. It was a problem. The group was on a strict schedule. They had that ride to catch, and the longer they lingered here the more likely they’d be caught. The coyote had a decision to make, and this is the one he made: he would leave the young girl behind, alone in the desert. He told her not to worry. They were in a remote canyon that was little traveled, but the Border Patrol would soon find her. Nearby, he claimed, were some pistas, platforms that la migra used as landing pads for their helicopters. Surely they’d be by soon, and they would take care of her. Her little brother cried and begged to stay with her. But Josseline was his big sister, and Josseline insisted that he go. As he recounted later, she told him, “T? tienes que seguir a donde estas Mam.” You have to keep going and get to Mom. "A keen-eyed perspective of how questionable public policy has resulted in far too much preventable loss of life, The Death of Josseline is highly recommended." "This should be required reading for everyone. . . . It gave me inspiration." "The many admirers of Enrique's Journey will find much to admire, and fear, in this powerful report." "A humane, sensitive, and informative perspective on a current and controversial topic . . . We all must pay attention." 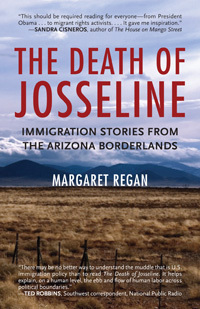 "In The Death of Josseline, Margaret Regan stands midpoint between immigration's push and pull . . . her clear and sympathetic eyes watching the south on its treacherous slog north." "There may be no better way to understand the muddle that is U.S. immigration policy than by reading these portraits of people who cross the border in hopes of a better life. . . . The Death of Josseline is an excellent way to understand-on a human level-the ebb and flow of human labor across political boundaries." "The Death of Josseline is a border reality check. It tells searing stories of those who've died crossing the Sonora/Arizona desert, of young people sent to prison in Tucson for the crime of working, and of the courageous people of conscience who stand up for the rights of migrants. Read it, and see why our deadly immigration policies need to be changed."